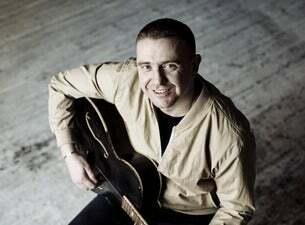 Damien Dempsey’s voice is Dublin yet wholly distinctive, almost clichéd to say it, but he is part of a rich bloodline of Irish singers from Luke Kelly to Ronnie Drew, Christy Moore to Andy Irvine. Their kin outside Ireland are Springsteen and Guthrie, Dylan and Marley. On his latest album Almighty Love, Dempsey’s sense of place reaches out beyond Donaghmede and North Bull Island, where he first performed in public as a teenager, across the Irish Sea and further afield. The locale is still in the lyrics. It’s there in the hauntingly poetical Chris and Stevie, a tribute to male bonding and grief. You can hear it in Canadian Geese - large migratory birds whose flight path took them past Dempsey's boyhood window. It’s there also in the references to railway tracks and waves, visible from the rooftops of Dempsey’s childhood home. Those railway tracks took Dempsey and his boyhood friends out into their own imaginations and he hasn’t forgotten. Almighty Love goes on a journey of a different kind. Dempsey, at 37 years old, has already said so much about self and state that trying to plough over old ground wouldn’t have been artistically challenging or fresh. So instead, he has given us an album of confidence and maturity, which has a more global sound to it and a broader scope. It is at once bigger and quieter, still rallying against injustice, yet with a more reflective and thoughtful tone, communicated more widely. Essentially, Almighty Love adds yet another batch of soulful, stirring, moving and powerful songs to Dempsey's already impressive canon of work, a collection up there with classic albums Seize the Day and Shots, and a reminder of his unique role in Irish culture.